NextGen Money offer Financial guidance to the next generation of students starting University. There friendly, objective source of financial guidance is delivered via a face-to-face discussion before your university course starts and then email nudges throughout the year. 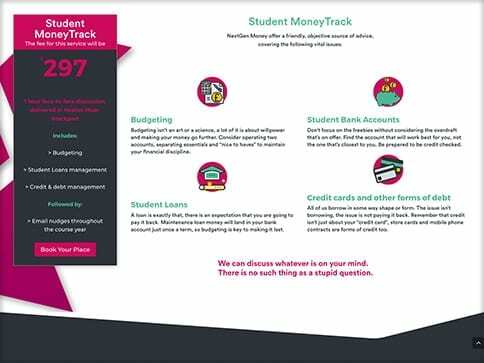 NextGen Money’s aim is to guide you through the potential financial pitfalls of student life and to give you someone to talk to about whatever is on your mind money-wise. 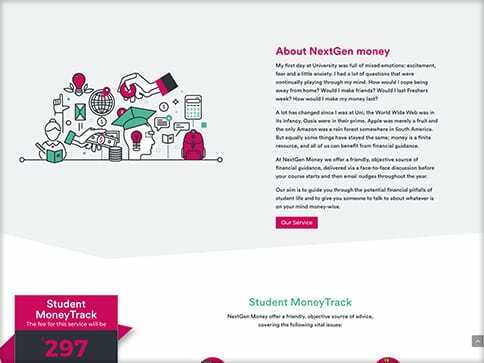 NextGen Money was a new venture from a local wealth management company.A chance remark prompted them to think about financial guidance for younger people. A little research led NextGen Money to the conclusion that there really isn’t much out there for them. The client wanted a simple one page ‘jump-to’ website which was young, fresh and energetic to engage a younger audience, whilst being informative for both student and parents. The brand was bright and bold with a focus on a good colour palette and contemporary icons.